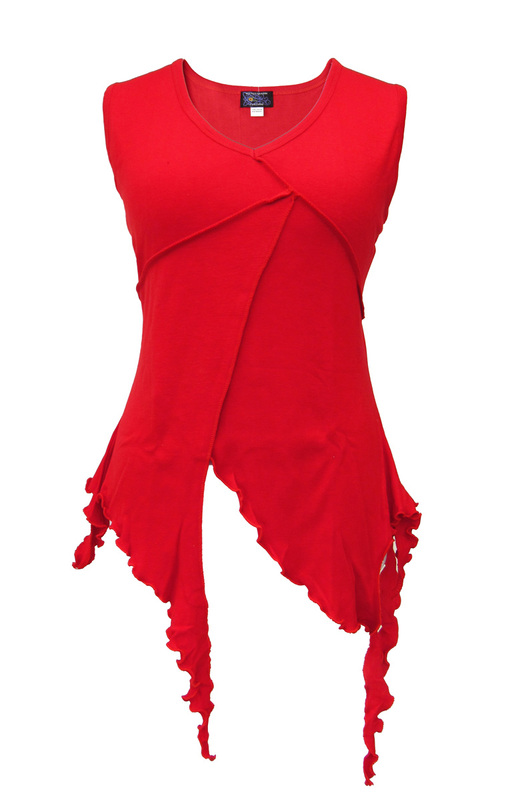 Our pixie tops always go down a storm, flattering and fun. This is the summer version, sleeveless and cool with a sweet V neck and that lovely trademark hanky hem, over-sewn carefully to create a really pretty frilly edge. Choose from several luscious shades and enjoy the feel of soft 100% cotton against your skin. It looks amazing with shorts and cut-offs, fab with harems, and gorgeous with one of our cute little pixie skirts. Very stylish, and from front on I look like I lost some weight. With my floppy belly though I do have to put high waisted trousers under or it will peak out of the opening. But As my confidence is growing with these clothes, I might just let it! I bought this to mix up with my Wicked Dragon wardrobe of clothing I am building up. Extremely comfortable and looser fitting than I expected (size 10) but looks lovely. So much so my mum has purchased one! I have the burgundy one and it washes well and feels special to wear as it is unique and different. Great fun top that fits lovely ! Super cute and very flattering fit. I bought the black and the purple . Absolutely gorgeous.